Taking another look at some print advertisements, here's a fun one from 1979. 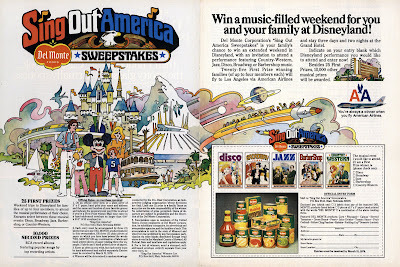 It's Del Monte's Sing Out America Sweepstakes. 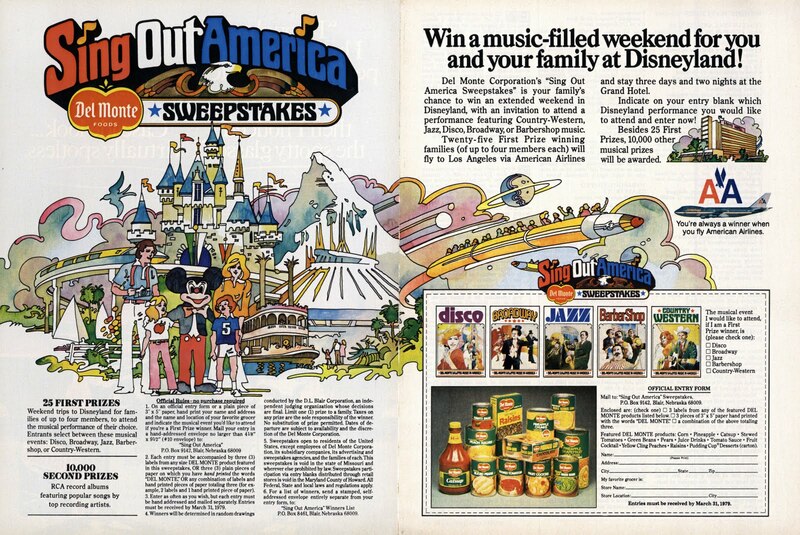 Win a trip to Disneyland and attend a musical performance of your choice, I'll take Disco! I believe that illustration was done by Don Weller, who was a very famous and popular illustrator at the time. He now does western art. very talented guy. That style is somewhere between "Peter Max" and "Trace Over A Photograph". It's more difficult than it looks since you have to think hard about what to leave out. VDT, you have to go look at the photo in today's post on Main Gate Admission. You will love it. I actually like this style of illustration, maybe because I was so aware of its "modern" style back then. It definitely evokes the era in which it appeared! Bannerizer makes it easy for you to promote ClickBank products with banners, simply go to Bannerizer, and grab the banner codes for your favorite ClickBank products or use the Universal ClickBank Banner Rotator Tool to promote all of the ClickBank products.